As a student in college, there are many instances when one needs to study for long periods of time. Sometimes when you need to study for an exam or do some homework, your dorm room isn’t the quietest place to get it done and focus. ECU‘s campus has many places that one can sit and relax and get whatever work or studying that they need to get done. Why not pick somewhere different and relaxing to make your studying experience more effective as well as fun! 1. Outdoor Area in Joyner Library. Many people know that studying in Joyner Library at ECU is a great idea, buy many don’t know about the secret outdoor area in the middle of the library. There is a small garden with tables and chairs that is very peaceful and quiet that is perfect for studying. This area is right behind the front desk area when you walk into the library and there is easy access to it. If you haven’t tried this spot out for studying, what are you waiting for? 2. Study Rooms in Residence Halls. One of the best places of all time to study when you don’t want to go too far from your room is a study room in your building. Many students utilize these rooms, and for good reason, as they are very quiet yet comfortable, and you can control the lighting as well as temperature of the room. You can also bring blankets, music, food, and whatever else you like to have while you study. They also usually have some of the most comfortable chairs to sit on in these rooms as well! 3. In an Eno Hammock in the Mall. The Mall area of ECU‘s campus is a wonderful place to be when the weather is nice, especially for those with Enos who need to study. 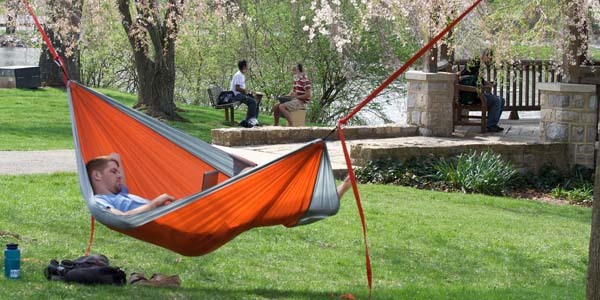 As the temperatures rise, more and more people in hammocks will appear in the mall of ECU. This is a fantastic and fun place to study as you can sit or lye comfortably while reading or writing a paper on your laptop while in nature! Even if you don’t have an Eno, many people bring blankets or sit on benches in the mall to sit and have a good study session! 4. Starbucks in Joyner Library. One of the most common things used to help one study is caffeine in coffee or tea. Not only does this keep you focused and awake, but can also bring you to a great environment to study. The Starbucks in Joyner Library is one of the quietest yet most comfortable places to sit and study. The atmosphere of this area is very focused and will keep you studying so you can be prepared for that exam. What a better way to reward yourself for being a good student other than some delicious Starbucks!? Not only is Mendenhall Student Center a great place to have a little fun with ping pong, pool, or bowling, but it also has a great sitting and relaxing area for peaceful studying. The sitting areas in the building have some of the most comfortable chairs as well as regular tables and chairs as well as a tv if you prefer to have noise in the background. There is also a Java City right beside the sitting area for easy access to a good coffee or snack! Not only is there a Java City in the building, but also right next door there is a Destination 360 where you can also find meals from Chick-fil-a, Grill Works, and Panda Express. There are so many different places to check out on ECU‘s campus, but these places are some of the nicest places to study that you could find to study for exams or complete homework. ECU does a fantastic job at making the atmosphere for students tailored exactly for what they need at any given time, whether it be for some fun, some relaxation, or even some studying!